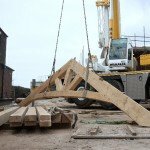 Truss delivered Mid November to Cambridgeshire, Ordered 17th of October delivered 4 weeks later! 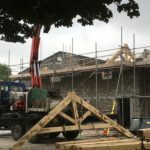 Our recent project is two raised tie stunning feature trusses, delivered to Buxton, Derbyshire, Client was very happy! 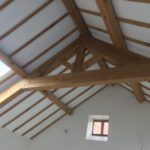 This Oak Truss Roof is now near to completion for our Client, Nigel, near York…..
“I’m delighted with the new Summerhouse that Altham Oak has produced for us, from the first moment I made contact with Gareth I got a very good impression, and he did not disappoint. I was kept informed of all design choices and implications of cost etc. I’m used to working with contractors and procuring works, so I know when I’m dealing with a company that is up front and on the ball with planning detail. Everyone here has commented on how spectacular the Summerhouse is and its transformed the whole garden! 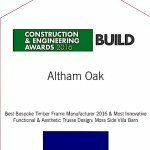 I was introduced to Altham oak by a contact involved in the early stages of my extension idea, from then on I liaised with Gareth and the team to build and develop the project. The design was discussed and agreed with detail with recommendations throughout. 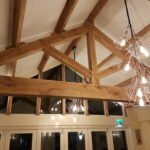 Altham Oak’s team arrived on site and from day 1 the quality was a different level, every piece of wood was hand crafted and shaped perfectly as per the design. 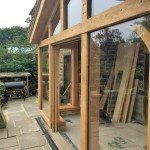 Each stage of the project was absolutely as I wanted and exceeded my expectation in most instances. 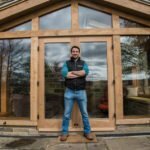 The primary craftsman was Liam, who was a pleasure to deal and work with during the build. 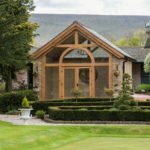 Each member of the team was professional and friendly with a real passion for the product they were working with. 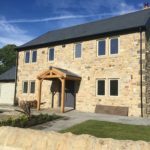 The whole project was managed from structure to glazing to the finest detail of hinges, handles and finishing touches. 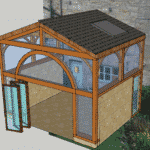 The extension has been likened to something off grand designs! The room is an extension to the house in Winter and garden in the Summer, we cannot wait to enjoy it to its fullest.